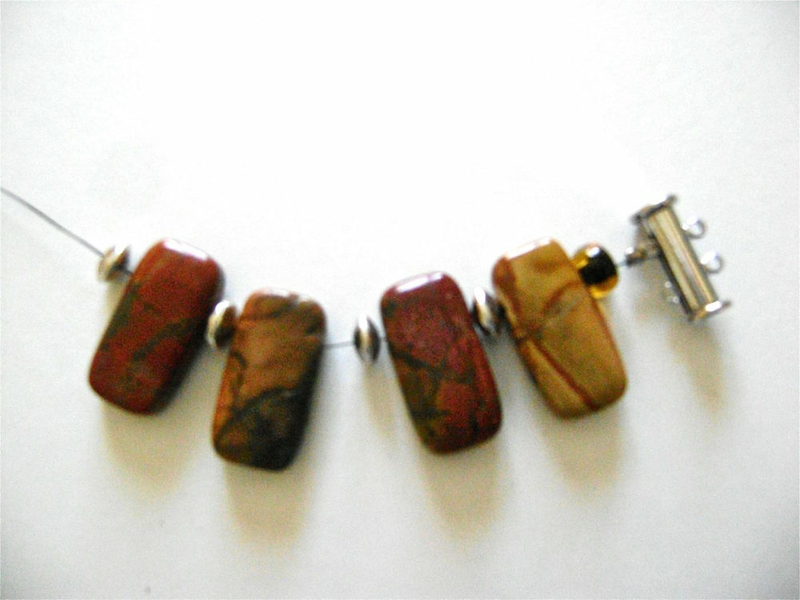 If you like Jasper Stones you may also like the Stretchy Simple 5 Stone Bracelet. The beautiful 10mm X 20mm pieces in this project are smooth with rounded edges and veins of rust, green, and gold streaking through them. Like an original piece of art, each one is unique with its own color palette and pattern. This bracelet is not an involved project. All that's required besides these stone beauties is a few spacer beads, beading thread, needles, a clasp, and a love for autumn colors. step 1 - Slip a small crimp bead onto approximately 24” of beading thread attached to a needle. Put the needlethrough the clasp loop. Go back through the crimp bead and pull it against the clasp. Use Double Crimp Pliers to secure the bead. Cut off excess thread. step 2 - Attach a 6mm round bead with a hole large enough to slip over the crimp bead. step 3 - Bring the needle though the top holes of 12 stone beads with a silver spacer bead between each. step 4 - Bring the needle through a round bead, through the loop of the clasp then back through the round bead and out through the stone bead. step 5 - Move the needle through the bottom hole of the stone bead. step 6 - Add on another round bead. step 7-Move through the bottom loop in the clasp and back through the round bead. step 8 - Move through the needle through the bottom holes of the stone beads adding spacer beads between them. Slip the needle through a round bead, through the bottom hole of the clasp, back through the round bead. step 9 - Finish and secure the work by going back through the stone beads, and tying slip knots between them. Double the fourth knot and cut away excess thread. The gorgeous, multicolored rectangular jasper in this bracelet is called "Picasso jasper", and the sandy colored beads in the Stretchy Simple 5 Stone Bracelet are called "Picture jasper", because the darker lines often create patterns or pictures. Picasso jasper has a really wonderful range of rich colors and patterns, and yes, that's natural (not color treated). It can have greys, rusts, yellows, greens, burgandy and more - like it's cousin Mookaite jasper.